It was a beautiful Sunday afternoon. Scranton was finally bathed in sunshine after several cloudy days. However, with my hangover, I wandered around the campus like a zombie. Yeah, that’s what you always do after a crazy night out--contemplate your life! Just as I was having my existential crisis, a spontaneous invitation from Carmen, another international student, started a journey to the Wild West. “So what’s your plan for this summer?” Carmen asked me while we were both sitting on the grass, relishing the sun. “I’m going to stay with my relative in LA,” I answered as if it was a matter of fact. “Cool! I will go on a road trip to the West, and I am looking for travel mates, so if you want to join...” Carmen invited. “I can,” I answered without thinking too much. “Yea! Let’s do it!” Carmen yelled with a sense of adventure, and that’s how it started. It sounds like a jest, but Carmen and I were serious about it. She invited me to her dorm to have dinner and discuss the itinerary, but we only booked the cheapest inn and agreed that she would drive to LA from San Francisco to pick me up, and then we would go to Vegas and the Grand Canyon, the simplest travel plan ever. ​“Geez! It’s final week!” I protested. Therefore, my protest soon became invalid. “Chin Chin! To our journey!” We popped a bottle of champagne and finished it with ice cream. That night, I didn’t study for my finals, but the careless fun of the dinner lives in my memory. On the day when I was going to meet Carmen, she arrived in LA at 9 p.m. with Max, an unexpected companion and Carmen’s boyfriend. He had decided to join us a day before. It was already dark and I could tell they were both tired from all the driving from San Fran to LA, but we had to keep on moving. We took turns driving the car. Maybe it was because we had never been to Vegas but I felt like we were driving on an endless road, trapped in eternity. By the time we arrived in Vegas, it was already 2 a.m.. When we got out of the car, we could feel the blazing hot air from Vegas on our skin. Exhausted, we still decided to check the casinos because we were in Vegas. However, I just felt more trapped. The bright lights blinded our eyes. There were no clocks in the casinos and everyone was absorbed gambling. We didn’t stay long in the casinos. We got back to the inn at 3 and we planned to wake up at 8 to go to the Grand Canyon. That was the first day. It was already 11, but we were still at the inn, just waking up. “Let’s just not go to the Grand Canyon,” Max complained. “No! We have got to go to the Grand Canyon. It’s my plan with Jason!” so we hit the road again. I felt trapped in the eternity of the endless road again. The huge rocks were right in front of us, but we only got a bit closer after an hour of driving. We didn’t know how many times we heard the same song on the radio, we just knew that at first we liked it when it was on, but when we heard it later we would switch the station right away. At 5, we finally got to the Grand Canyon. The sun was setting so Carmen and I seized every moment trying to capture the view. It turned out that Max had acrophobia so he stayed in the car. When Carmen and I were by the cliff, I asked her about Max. “I don’t know. 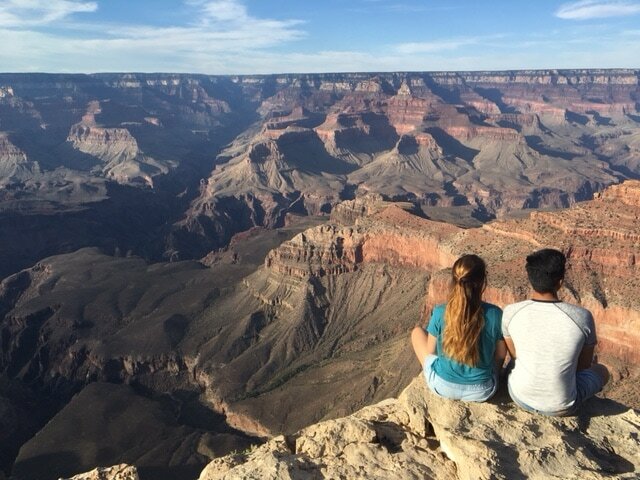 He never was my type, physically, but whenever I am with him, I just feel happy.” Not only did I see the magnificent landscape, but I also witnessed a side of love at the Grand Canyon, and when the sun set, I felt the endless eternity relieved by a kind of blessed infinity. ​On the way back, Carmen and I were sitting in the front, while Max was snoring in the back. “Can I ask how did you make the pasta? It was so good!” I asked because I really wanted to know the secret. “Haha! You really wanna know? So it’s really simple. You just need onions, tomato sauce, tuna, and cheese,” Carmen answered with a smile on her face, eyes fixed on the road. “Any particular kind of tomato sauce?” I asked again as if I wanted to know the real secret. “The cheapest one,” Carmen answered, driving at 90. “That’s it? And how much do you put in the pasta?” I couldn’t believe what I heard so I asked further. I realize: it’s not about the ingredients, and it’s not about what we did on this journey. It’s all about the process. The journey was just like the pasta that Carmen had made. There wasn’t a specific written itinerary but only the general destinations that we would head to. We embraced and enjoyed the variables along the way and that was what made the journey unique. ​Back to LA, Carmen and Max drove me to my relatives’. I was not sure if I would travel with them again, but as they each offered me a warm embrace, I knew that there is bound to be another journey, that life is the journey.